One Way Ticket To Oregon…It’s a gentle ride. When death comes calling, how do you reply? Producer Jeremy Aldridge and Director J.J. Mayes bring to life playwright, B.C. Caldwell’s extremely intimate and inspired (from his hospice caregiver Aunt Lucille) story about how one person’s life & death decision reverberates throughout a family. One Way Ticket to Oregon, a world premiere, currently at the Promenade Playhouse, is a real-time, painstakingly written narrative centering around Leigh Anne Rainey (Ruth Silveira), a fiery, Southern gentry woman in the last phase of her life, and her lifelong friend, June Collins (Cydney Wayne Davis), an older no-nonsense, African-American woman with an intuitive understanding of people. Leigh Anne lives in the White House, a cherished home that has been in her family for 150 years – a family who also built the local Church where she’s devoted a lifetime of loyalty, service and money. 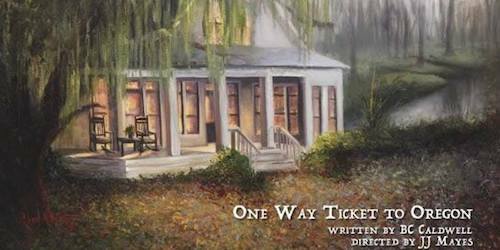 One Way Ticket to Oregon takes place in Alexandria, Louisiana during the very hot and humid summer of 2010. Leigh Anne receives a diagnosis that her cancer has returned and spread to her pancreas, and she’s forced to confront her mortality. When she learns about doctors in Oregon who can legally help her to “die with dignity,” she wrestles with her faith, her family, and even the pastor of her Church to end her life on her own terms, rather than die slowly, consumed by pain. She is determined to take control of the final words and actions of her own story. The dying part is easy. It’s the all the people in her life that are complicating the matter: Her pastor, Father Brooks (Dennis Delsing) who downright rejects the notion that she could even consider assisted suicide, and who even rejects her as part of the Church community; her daughter-in-law Eve (Rebecca Radock), who is desperate to leave for a more fulfilling life; her autistic grandson Duke (Cash Beery, for this performance) she’s too exhausted to physically care for; and her son Duke (BC Caldwell) an immature father, completely reliant on her stability. Everyone seems to resist what Leigh Anne feels in her heart is best for her. Only June, who is now her regular caregiver seems to understand, excruciating as that understanding is. It is also through June’s remembrances, silly stories and plain wisdom that the family navigates its conscience and the fog of this journey. One Way Ticket To Oregon is as long and lulling as the Southern Summer. A bit too long in length and occasionally uneven in the ensemble work. But it’s not without fine merits. Although some actors are more sophisticated, emotionally available, and nuanced than others, there’s also something important in that, which actually plays well to the story. The often inarticulate awkwardness represents a certain reality, as does the evocative quietude inside many of the scenes, that an otherwise hyper-polished production might too easily replace with clinical effect. There is a huge opportunity to enjoy the drawl of very ordinary people, in the very ordinary moments of their lives. It’s totally and beautifully relatable. Davis and Silveira are respectively insightful in their portrayals of Collins and Rainey. There are such gorgeous moments between them. There is so much honesty. Melvin Ward also plays a stand-out role as Andre Calhoun, June Collins’ nephew on his way to University to study dentistry, and who supplies Leigh Anne with both kindness and medical marijuana. As a whole, One Way Ticket To Oregon is a profoundly satisfying expression of human choice. Featured in the cast (in alphabetical order) are Cash Beery, BC Caldwell, Cydney Wayne Davis, Dennis Delsing, Matt McVay, Robert Paterno, Anderson Piller, Rebecca Radock, Ruth Silveira, Bryan Staggers and Melvin Ward.